This student submission comes from my former student Deanna Cravens. Her topic, from Precalculus: introducing the number . The number e is a relatively newer irrational number if compared to pi. However, it first made its appearance very subtly in 1618. Napier was working on a table of natural logarithms, however it was not noted that the base was e. There were a few other appearances of e but mathematicians had not truly made a connection to it. Eventually in 1683, Jacob Bernoulli was looking at a business application dealing with continuously compounded interest and recognized that the log function and the exponential function were inverses. In 1690, a letter was written by Leibniz and e officially had a name, except it was called ‘b’ at the time. As it comes to no surprise, Euler had his hand in discovering e. He published Introductio in Analysin infinitorum in 1748 where he showed that e is the limit of . Now Euler did not explicitly prove that e is irrational, however most people accepted it at that point, but it was indeed later proven. Where does the number e come from? Well, the answer is a business application dealing with continuously compounded interest. However, students in a pre-calculus class can easily discover the number e without having to use the calculus behind it. Simply give students this short activity at the beginning of class. One of the good things about this activity is that it gives a brief snippet of the history of e before students begin to calculate it. 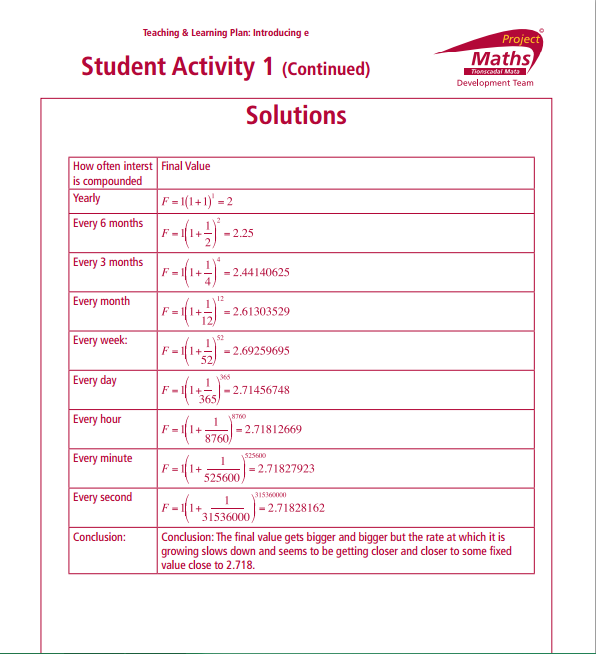 Then, students can easily use a calculator and plug in the listed values in the table into the equation . As the numbers get increasingly large, students will notice that they will all appear to be getting closer to 2.718… which is now known as the number e. As a teacher it is important to note that e is like pi, it is an irrational number that goes on forever and doesn’t have any sort of repeating pattern, yet it is extremely important in mathematics. 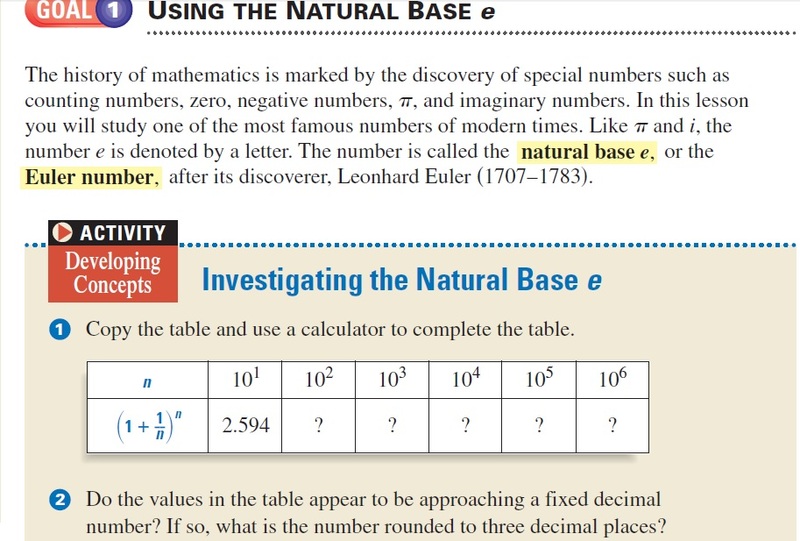 This video would be excellent to show students who are asking, “why is e so important or where does it come from?” The video starts out by stating what e is approximately equal to. Then it gives a brief history about e and talks about compounded interest. 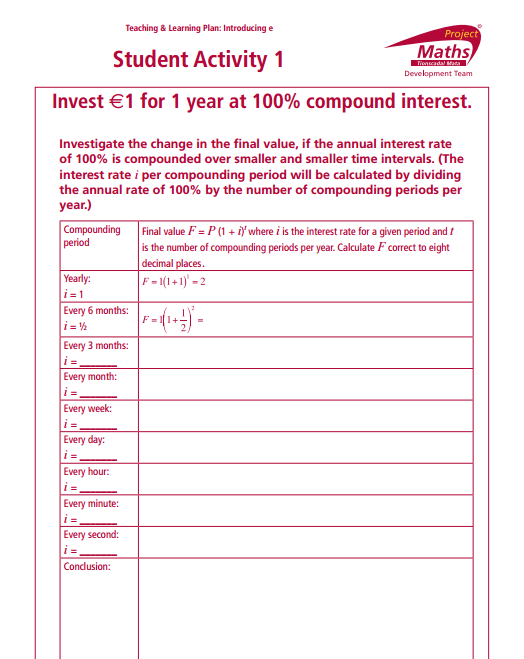 It does a great job at explaining compounded interest. It is executed in a way where pre-calculus students can easily understand the concept. It also uses good visual cues to show how it would work. Next it lists several applications of e. These applications include: statistics through the normal curve, biology by modeling population growth, and physics by the exponential decay of a radioactive material. Overall, it does a great job showing the importance of e in real world applications. Thus, showing the importance of e to a pre-calculus students. My students invariably love this story; let’s take a look at the second calculation. This compares favorably with the actual answer, . In this series, I’m looking at a wonderful anecdote from Nobel Prize-winning physicist Richard P. Feynman from his book Surely You’re Joking, Mr. Feynman!. This story concerns a time that he computed mentally for a few values of , much to the astonishment of his companions. Part of this story directly ties to calculus. As noted, this refers to the Taylor series expansion of , which is can be used to compute to any power. The terms get very small very quickly because of the factorials in the denominator, thus lending itself to the computation of . Indeed, this series is used by modern calculators (with a few tricks to accelerate convergence). In other words, the series from calculus explains how the mysterious “black box” of a graphing calculator actually works. For now, I’m going to ignore how Feynman did this computation in his head and instead discuss “the table.” The setting for this story was approximately 1940, long before the advent of handheld calculators. I’ll often ask my students, “The Brooklyn Bridge got built. So how did people compute before calculators were invented?” The answer is by Taylor series, which were used to produce tables of values of . So, if someone wanted to find , they just had a book on the shelf. For example, the following page comes from the book Marks’ Mechanical Engineers’ Handbook, 6th edition, which was published in 1958 and which I happen to keep on my bookshelf at home. Look down the fifth and sixth columns of this table, we see that . Somebody had computed all of these things (and plenty more) using the Taylor series, and they were compiled into a book and sold to mathematicians, scientists, and engineers. But what if we needed an approximation better more accurate than four significant digits? 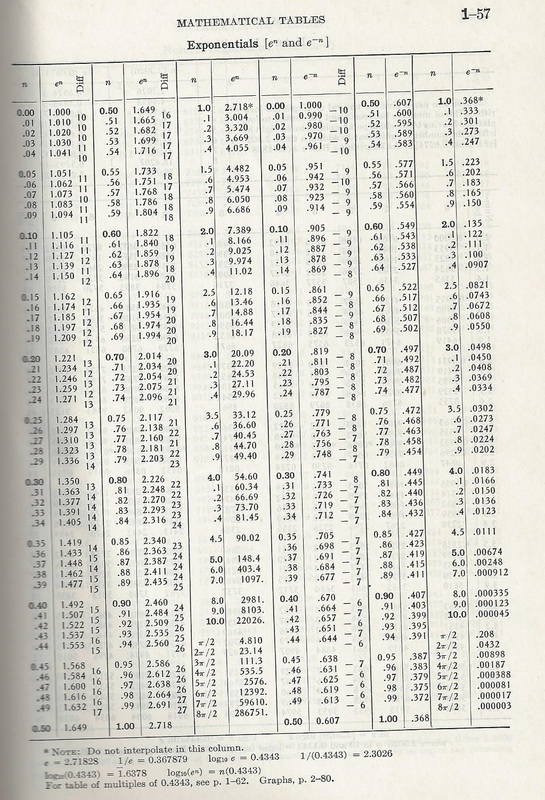 Back in those days, there were only two options: do the Taylor series yourself, or buy a bigger book with more accurate tables.